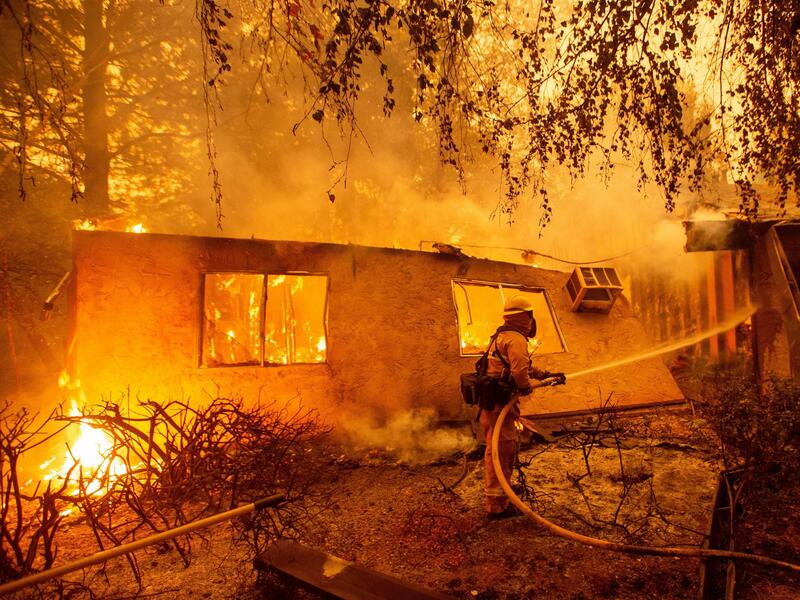 Firefighters battle flames at a burning apartment complex in Paradise, Calif., in November. PG&E could shut down power to as many as 5.4 million customers during extreme weather conditions. Pacific Gas & Electric could shut off power to more than 5 million customers when extreme weather conditions are ripe for wildfires to break out, the company said Wednesday. It's an expansion of the company's previous power shutoff program, which only let the company turn off power to about half a million customers. Several power companies submitted their required "wildfire mitigation plans" to California regulators this week. But PG&E's plan may be especially consequential, given that its power lines have been blamed for several Northern California fires over the past few years. The company filed for bankruptcy last month in the wake of billions of dollars in potential liability after two years of wildfires. The company told the state's public utilities commission that to address wildfire risk, "shutting off power will likely be necessary and may need to be performed more frequently due to the extreme weather events and dry vegetation conditions." "We understand the urgency of the situation, that lives could be at stake and that we need to move more quickly," the company said. In 2018, the company's "public safety power shutoff" program affected up to 570,000 customers. This year, the company plans to include its entire 5.4 million electric customer base in the shutoff program. PG&E said it would try to alert customers within 48 hours of a power shutoff. PG&E will only turn off power "as a last resort," a company official told The San Francisco Chronicle. And the company stressed it wouldn't consider shutting off power to all customers at once, the Chronicle reported. PG&E also plans to trim or remove an additional 375,000 trees in 2019, to clear leaves and branches from around distribution lines. And it plans to conduct many more "enhanced" inspections of distribution poles and transmission structures, it said. The California Public Utilities Commission will need to review and approve the proposal. PG&E cautioned that the company's bankruptcy filing could impact its ability to successfully implement its plan. Mark Toney, executive director of the Utility Reform Network consumer group, told the Chronicle that PG&E's plan is a sign of mismanagement of the power grid and failure to properly keep trees trimmed. "We're paying them to keep the power on," Toney said. "Now we're paying them to shut us off. There's an irony in that." Of the seven other utilities that submitted plans to regulators, "none included the significant reforms PG&E was proposing," the Associated Press said.